It’s fall and that means pumpkin spice season! These little muffins have all the spices from pumpkin pie and are perfect for breakfast or as a snack. 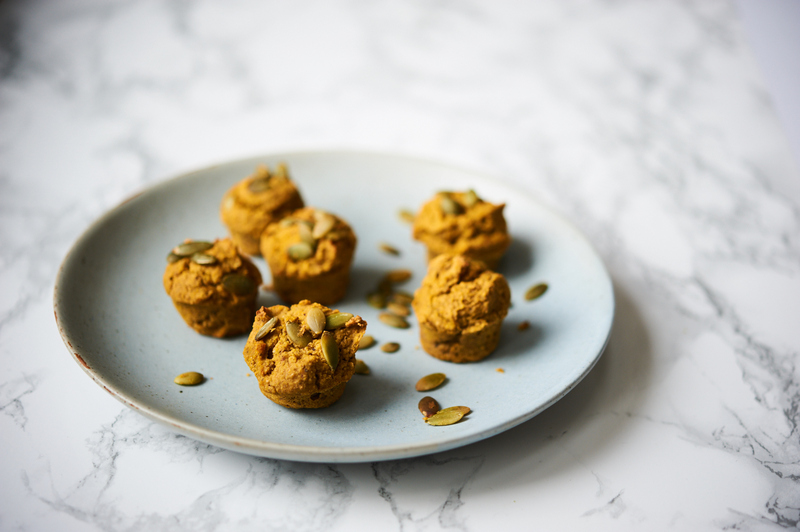 Buckwheat is a gluten free grain that has an earthy taste that can be noticeable in some recipes, but pairing it with oat flour in these muffins helps to mellow out the strong flavour. Pumpkin (and squash) is a wonderful seasonal vegetable to eat in the fall and winter because it’s packed with vitamins and antioxidant strength. We recently learned that it’s especially important to purchase organically grown squash (and pumpkin). These veggies are particularly good at pulling contaminants and chemicals out of the soil they grow in (which means it’s going right into the squash we eat as food). So, stick to organic squash and pumpkin. One more note for this recipe: You’ll find that these muffins are not too sweet. If you have a big sweet tooth, you could add an additional Tbsp of maple syrup to the recipe. 1. Preheat oven to 375. Combine the dry ingredients in a mixing bowl. 2. Mix together the wet ingredients and then fold into the dry ingredients. 3. Scoop out the muffin batter into a mini muffin tin (you can line with parchment paper muffin liners to make it easy to pop them out of the tray). Sprinkle a few pumpkin seeds on top of each muffin. The batter will make 24 mini muffins. 4. Bake for 20-25 minutes, until muffins are cooked in the center.